The media are in crisis. Confronted by growing competition and sagging advertising revenue, news operations in print, on radio and TV, and even online are struggling to reinvent themselves. Many have gone under. For too many others, the answer has been to lay off reporters, join conglomerates, and lean more heavily on generic content. The result: in a world awash with information, news organizations provide citizens with less and less in-depth reporting and a narrowing range of viewpoints. If democracy requires an informed citizenry, this trend spells trouble. 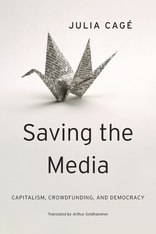 Julia Cagé explains the economics and history of the media crisis in Europe and America, and she presents a bold solution. The answer, she says, is a new business model: a nonprofit media organization, midway between a foundation and a joint stock company. Cagé shows how this model would enable the media to operate independent of outside shareholders, advertisers, and government, relying instead on readers, employees, and innovative methods of financing, including crowdfunding. Cagé’s prototype is designed to offer new ways to share and transmit power. It meets the challenges of the digital revolution and the realities of the twenty-first century, inspired by a central idea: that news, like education, is a public good. Saving the Media will be a key document in a debate whose stakes are nothing less crucial than the vitality of democracy.